Looks like a painiting. Wonderful! Wow! 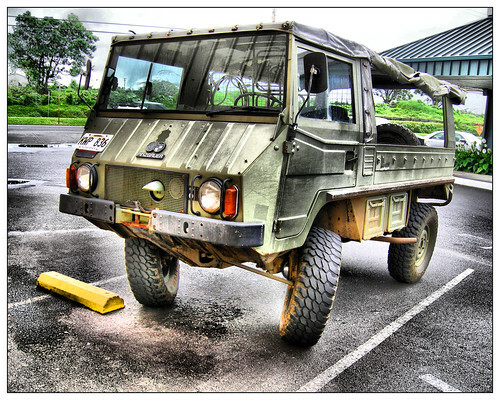 A Pinzgauer in Hawaii 🙂 Great HDR, great Puch. Great work too!!!! :O) …. Aloha!!!! How can you do this???? I wold like to know, cause i love this effect!!!! Wow, I love the effect! Wonderful! Nice job, shows off the vehicle very well. If you’re not using HDR, thenl you’re using magic. This is one rugged looking little puppy. Nice shot, Alan. Well, this got a smile out of me! Good work. wow what a fun car? Great colors, I wish that were my rig. Haha. Very interesting Photo….Very interesting vehicle. I love this image – how are you controlling the exposure on your Coolpix P1 and getting the HDR processing software to do this? I thought the camera only had an auto mode. I am trying to do HDR with my coolpix P1 and i am wondering the same question, i’ve set as much stuff as i can to manual, and i have to use exposer compesation to change exposure levels synteticly and i still cant get photoshop to merge HDR right.